Imagine lounging in your backyard surrounded by friends, drinking wine, and breathing in the scent of homemade pizzas baking in a traditional ilFornino® Wood Fired Pizza Oven. The warmth. The aroma. The taste. What more could you ask for? The ilFornino Wood Fired Pizza Oven will bring the Mediterranean lifestyle to your home with unmatched authenticity, sure to delight the most discriminating of guests. While traveling through Italy, I was fascinated by the way pizzas were made in Naples, the birthplace of pizza. 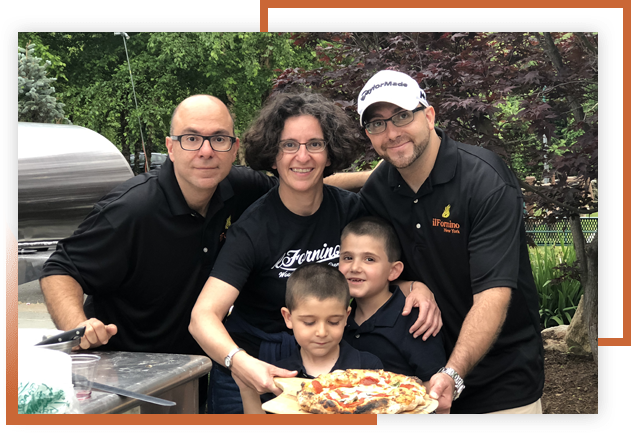 The wood fired pizza ovens offered the proper environment to create traditional Italian pizza, famous throughout the world. But it wasn’t just the taste that satisfied. The skill of the chef amid the relaxed atmosphere as people watched and waited, chatting with each other as their pizzas bake in the ovens. The pace of life had been slowed and people had time to actually enjoy life and each other’s company. I knew right away that I wanted to bring this experience home to New York. More importantly, I wanted to duplicate this experience in a way that the general population could also recreate and enjoy. Inspired by the traditional ovens of Naples, Italy, ilFornino® New York Wood Fired Pizza Oven was born. Designed like no other oven, its portability and ease of use offers old world performance in a lightweight affordable solution. A variety of models have been created to suit the various requirements that people have. Now your can create a focal point in your backyard surrounded by friends and family, drinking wine, and breathing in the scent of homemade pizzas baking in a traditional ilFornino® Wood Fired Pizza Oven. The warmth. The aroma. The taste. What more could you ask for? The ilFornino Wood Fired Pizza Oven will bring the Mediterranean lifestyle to your home with unmatched authenticity, sure to delight the most discriminating of guests. All ilFornino® stainless steel wood fired pizza Ovens are fully assembled when they arrive, with the exception of the chimney stack and cart, which is optional for outdoor kitchens and barbecue islands. However, just selling an oven wasn’t enough. A company infrastructure was created to support, innovate, inspire and educate was necessary to make sure our customers would be successful. This we have achieved and are proud of our commitment you. ilFornino® Wood Fired Pizza Oven – offering the taste and tradition of Italy in your own backyard.